Poor Canberra. There doesn’t seem to be much going on in terms of records. It used to be quite a place – until many of it’s indie stores sold up, and JB Hi-Fi rolled into town. It seems like the only place to get decent records is the last indie shop in town – Landspeed Records. Landspeed is quite a cool shop. They do more than just CDs and records – they have clothes and some merch. It’s kind of the way of the future for music retail. There’s not a big collection of records, but there is some nice second hand stuff. It is pretty much the only record stop in Canberra. And poor Graham Nash. I used to love this record but it hasn’t dated well. I saw Crosby, Stills & Nash live a few years ago, and it descended into parody. Outdated 60s ideals – still peddled. It was an oldies show. It sounds pretty good, but Military Madness, We Can Change The World and Chicago have dated badly. He’s stuck in the 60s, and it’s too bad. But then there’s Sleep Song. A classic. So very Graham Nash. I would say it’s his best song. It’s yet another song he wrote for Joni Mitchell. And I love Joni and Graham together. I think they inspired the best out of each other. Probably the best two people have ever inspired eachother in the history of music. The tender moments on this record are still great. Rightly so, this was Nash’s biggest solo album, and came right at the peak of his career. He never really achieved solo success again after this, and rolled happily into the plomp and bombast of endless CSN reunions. It’s not a terribly uncommon vinyl find, but an original European pressing, with the classic Atlantic label, is definitely worth the $10. Continuous Hit Music – a weekly exploration of vinyl finds. Eggs Records has become an essential part of the Newtown record scene. It has the biggest range of second hand vinyl, and a fine selection it is. Plenty of 70s and 80s stuff – I picked up lots of Replacements vinyl here. Also the originals of all the Wilco records and other great finds. The only shame about Egg is that they certainly know how to price a record. It’s old school vinyl-ing. The guys go on buying trips around the world. They are always at the record fairs. They sponsor trivia prizes and are generally part of the record community of Sydney, of Australia and beyond. But onto this record. The Only Ones. There was actually several years where the first thing I did in a record store was go to the “O” section. Because I was looking for this album and Oasis’s What’s the Story Morning Glory. I have clear memories of finding one with Isabelle in Perth in 1999 or so. I wanted one ever since. Special View is not actually an album, but a compilation compiled from two albums, and marketed as an album to the US market (they did the same thing for Robbie Williams’ The Ego Has Landed). And because of that, it is by far the best Only Ones album. I loved this band for a while. They were looped into the punk scene, but had a great guitar player and a snarly singer, and didn’t seem to just be angry. I always loved the melodic, new wave-y side of punk best, and this was one of the very first albums that started me down that road. Of course, I came to them through Another Girl, Another Planet, their timeless hit, probably on a compilation like ‘The World’s Greatest Punk Album Ever’. Then everyone seemed to cover the song – most famously for me, the Replacements. The Reservations covered Another Girl, Another Planet many times. It is just a blistering song. The sly build up, that rush of guitar soloing, and that snarl! Something about girls, something about planets, and maybe something about drugs. It was endlessly hip. It is by far the best song on the record, but there are some excellent songs that fill this record out. The Whole Of the Law is a very pretty tropicalia love song. Peter And the Pets should have been a hit. And some decent new wave fare in Out There In the Night, City Of Fun and more. It’s better than, say, Blondie. So after over a decade of hunting for it, I was pretty happy to find this on vinyl, finally. I don’t really listen to the band anymore, but was really happy to revisit it. As far as I know, this record has never been reissued and so this is an original Epic printing (with the awesome Epic label on the record). $24.99 is a pretty Egg records price. Expensive but where else are you going to get it? Special View has now been superceded by deluxe editions of their three albums, a hits collection and a complete collection. Shame, because lots of American fans, and myself, know and love this album in this order and sequence. And this album cover – once again great. Oh well. They can erase it from history. I have my copy now. PS. I saw a reuinited Only Ones on telly a couple of years ago and they looked awful. I could not even fake interest to go. Newtown in Sydney, the part of town I’ve been drawn to for all my years in Sydney, has been pretty good with record stores. Even with the fall of CD stores left and right, the three on King Street survived the last five years. Pretty amazing. HUM is a small chain store, but a pretty hip one. The Newtown store stocks a healthy shelf of new release vinyl, and they keep some in their store window to entice passers by. It’s a good place to pick up something new, say an Arctic Monkeys record. They order a lot and not all of it moves. I found this album in a small pile of lightly discounted new records. The price sticker for $34.99 crossed out and it cost $24.99. 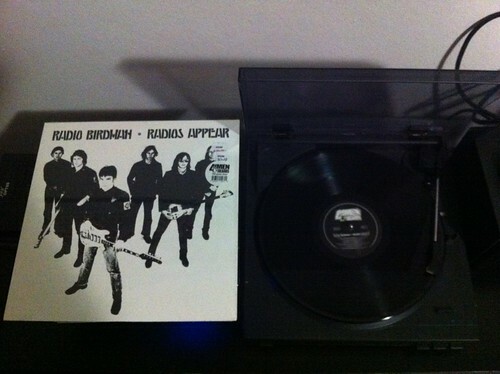 Radio Birdman. You know, of all those underground 80s Australian bands, the Birdman are not my favourites. I guess I leaned towards the wussier side of things – Go-Betweens and that. But they are as good a raw and dirty rock band as any produced, anywhere in the world. And this album, their debut, has some of their signature songs – New Race and Aloha Steve & Danno are probably the ones people have heard of. Both blistering pieces of rock. But there are longer, dirge-ier moments and I have to confess, that stuff loses me sometimes. Still, this is the record I reach for when I want to hear Birdman. Anglo Girl Desire. Their cover of You’re Gonna Miss Me. Non Stop Girls. Damn this is a good record. I would even say this album is a better introduction than any of the best-ofs out there. I discovered Birdman, along with 50 other important bands, from Clinton Walker‘s wonderful book Stranded. They are given great importance in that book as being pioneers. Pretty interesting that they missed out completely from Triple J’s recent Hottest 100 Australian albums poll. It made number 13 in the book The 100 Greatest Australian Albums. This version is actually the international tracklisting and cover. I want to be a stickler for the original Australian version – but I just can’t. Just look at that beautiful album sleeve. It is just the best. Possibly the best Australian album cover ever. And whoever looks after their catalogue should be shot. It takes Americans to reissue and take care of their music. The original might be a bit more pure, but this version cuts out a stooges cover and adds Aloha… so as sacrilegious as it sounds, this is my version of this record. And it’s the one I grew up with. I don’t think this record, this reissue is particularly rare. But I’m pretty thrilled to own this record on vinyl – if only for that awesome album cover looking in all it’s glory. Let the Birdman fly, eh?